Making sense about the economy today. As I travel the 15 minutes from my home to work I see four vacant strip malls. Maybe a restaurant still survives and a dry cleaner, but mostly I see vacant space, empty parking lots and for rent signs. Retail is dying out in my area of Chicago suburbia. It appears the space will be empty indefinitely as Amazon remakes retail. Food delivery will expand as people get used to ordering their asparagus from photos. Prepared food will continue to grow in popularity from restaurants and specialty retail shops. There is an opportunity for independent food outlets who know their niche and can execute because supermarkets generally cannot manufacture palatable prepared food. The sterility of most supermarkets gives Amazon an enormous opportunity to use Whole Foods to remake the space, but early returns indicate that they are in the learning stages. I used to love to peruse a good supermarket, but today I hate them. They deserve to struggle against restaurants and specialty shops until they become competitive. Demolition of Lincoln Mall in Matteson IL. 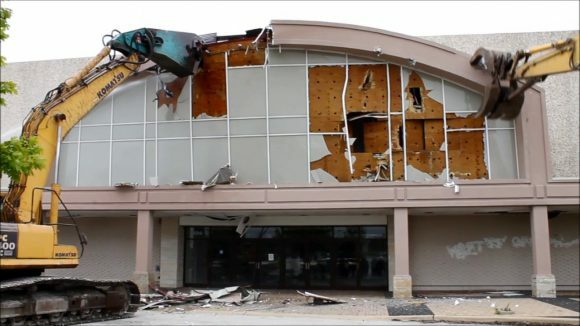 Will the empty malls find an economic purpose? The only category with traction today appears to be restaurants, primarily fast food. They do not require huge square footage and parking. When the financial entities blessed with these properties finally are forced to pay their taxes and utilities, the grass starts growing in the parking spaces, vagrants occupy the store aisles and lawyers are no longer being paid to try to collect rents from defunct businesses we will see some movement. There will be demolitions if people will pay for the wrecking balls. If towns had the money they could make appealing parks and public spaces, but generally they don’t have funds today. It looks like suburb rot for the next decade to me. The Fed is pushing rates up because that’s what the playbook says it should do. It makes sense if you are a central banker with degrees in economic orthodoxy, but I ask, why try to raise rates when there is little inflation except in real estate in a few cities on both coasts and in affluent caucasian enclaves? The American economy has struggled for a decade. Middle and lower income people have lost ground, school debt is a crushing problem and healthcare is a disorganized mess that most people struggle to finesse. Manufacturing here is finally competitive worldwide after two decades of shrinkage. The stock market is probably in the latter stages of the “Trump Bump.” American education is less favorable to the lower and middle incomes than 20 years ago, and the gap between elite and average schooling seems to be expanding. I think a few more years of relaxed interest rates would be helpful for the bulk of the population who do not rely on interest for its wellbeing. Fortunately, money still likes to buy American issued debt as the Fed struggles to strangle us with high rates. The tax bill passed in December is a mishmash of restructuring, but the bottom line is that it will help most people in America. The Nervous Nellies and Sourpuss Democrats shriek about it, mainly because they are supposed to hate it, but it has a lot of goodies to be sprinkled into the economy. The question that does remain is whether the increased deficit will be difficult to borrow money for. Early indications are that it will be easily digested by the enormous American economy, which is growing at almost 3%. A big hiccup like 2008-2009 coupled with the stupidity of Wall Street gamblers could upset the apple cart. That’s why you keep money in the cookie jar. My belief is that the best hedge against a recession and inflation is creativity, risk taking mentality, and optimism. I’ve been observing markets, the economy and happiness for a long time, and following the crowds is usually a good way to lose. Listen to your gut and then pursue something else because your gut is always chicken. Question: How often do you eat a homemade dinner? We cook dinner 5-6 times a week. My teenage son always wants to know what we are cooking and my college age son frequently stops in to devour the leftovers. I enjoy a homemade meal 5 to 6 times a week. When I don’t it is because I have asked my wife on the way home (we work together) if she has any plans for dinner. If there is a pause, or a ‘No”, it my hint she would enjoy a meal out. I agree with your article – nice job! Noah and I try to cook dinner most nights of the week, but the degree of difficulty varies–we often end up making omelets or breakfast for dinner when we want something quick! We also like to try and make “extras” whenever we make dinner so that we potentially have leftovers to bring to work for lunch. As Stephanie just said, we are trying to cook dinner often, primarily for health reasons. A bit time consuming but satisfying and fun too. As far as the commentary in the blog on supermarkets, Stephanie and I often enjoy supermarkets when we go shopping. It’s hard to go in and out fast. We think it’s still fun to buy produce and see what other goodies we can find. Though living in Chicago as opposed to a suburb has better options like Trader Joe’s, Whole Foods, Mariano’s, and even our local Jewel which has upped their game to keep up with the more glamorous stores. Of course, the farmers markets in the summer are the best! Eleven out of twelve meals are home prepped. It gives me something to do in the 6 o’clock hour instead of watching the news. Retired now, cooking dinner gives me something to look forward to! My wife tries to keep me away from the supermarket. I make a homemade meal form my family of four almost every night. We might have take out or go out once or twice a month. I do use Dream Dinners (somewhat similar to Blue Apron) which helps make preparation easier for about 6 dinners a month. Other meals may not be fancy, but preparing larger dishes ahead to freeze some or serve more than one day help. I think it is worth the effort, though not easy with busy schedules. With young children going to a restaurant is more challenging than cooking at home. We really only have fast food on long road trips. We eat in about 6 nights a week. We avoid eating out if possible because we like to eat organic, non-GMO, grass-fed, pasture-raised foods. Restaurant food is generally low quality and full of bad fats (canola/rapseed oil). Trickle down economics hasn’t worked in the last 40 years, the people at the top got richer and richer and the folks like us lost more and more of the pie to them. Not sure how this current round of tax cuts will be any different. And Yet, people of your particular view are always advocating for the trickle down system of government confiscation and redistribution, filtered through hands of countless unaccountable agencies, politicians, and cronies making the counties around the DC area the richest in the country. That is a far worse system. Ok, I’ll swing the pendulum hard the other way: I rarely have a home cooked meal, especially in the winter. We have stacks of frozen Lean Cuisines in the freezer for the week days, and eat out on the weekends. Our grocery stores in Milwaukee seem to be doing a turn over: Pick N’ Save and MetroMarket just got bought by Kroger and the quality is declining. I am a big fan of the salad bars at the grocery store, and the Whole Foods near us has a great one. Also, gotta plug the independent grocery stores: Glorioso’s in Milwaukee has a fantastic deli, although you’ll pay for the convenience! I eat mainly at home. Eating out is mainly my wife’s idea, if we do. Chicago is a democrat city. Socialist democrats seam to destroy cites faster then German bombing did in WWII. Your description of the Chicago suburbs is one-sided to me. Many suburbs seem to be thriving with home prices on the rise. Right or wrong, it depends on what side of the tracks you’re on. My home has become my largest source of wealth, as my income is modest so saving is mostly for retirement. I bought it in 2008 for $149,500 and it’s worth $250,000 today. It was a smart move and I’m incredibly grateful I made that decision. It was based on lots of research though, and I waited for a steal. While the $100K profit looks nice on paper how much of your real estate taxes are eating that profit away? IL in general is in a terrible downward slide with no correction in sight except more and more taxes. I have 3 nice properties in 3 different states. Their 3 tax bills combined don’t equal 1 Cook County bill. Pretty sad and they are all high value properties in good locations, FL , AZ & MI. Many if not all of my friends have fled the state for good being tired of being punished for living here. Good luck on your investment. I rent in IL I have never owned here and never will. By the way I eat out a lot, maybe 2 meals a week at home. Hi, Greg. Though I say I’m in Chicagoland, I’m actually on the Indiana side of the IL/IN border in Munster. Many consider Lake County in Northwest Indiana a Chicago Suburb. My property taxes, even with the school referendum that just passed to help keep our schools top notch, are $2800/year — super reasonable. You’re right though, if my 1960s all-brick ranch on 3/4 of an acre were on the Illinois side, my property tax would be more like $5000-8000/year, depending on which town I was in, and it would not have been nearly as smart of a purchase. I did look at buying in Illinois initially, and even made an offer on a foreclosure in Flossmoor, but the $110k sale price couldn’t even hook me in when I learned the property taxes were $7000/year. Absurd and unsustainable. On another note, I think legalizing recreational marijuana is looking like a real possibility now as an attempt to save Illinois from financial ruin, it’ll be fun to watch from across the border.